Artists For A Green Planet From the Arctic to Africa, the Earth is feeling the eﬀects of climate change. The environment is deteriorating. The ocean, the land, and the air are suﬀering a process of degradation – with unpredictable consequences. The exploitation of natural resources has caused deforestation, desertiﬁcation, oil depletion, greenhouse gas increase, water pollution, the extinction of species – and the list goes on. With our special issue, "Artists For A Green Planet," we want to take a stand and join the green cultural revolution that is transforming lives worldwide. Standing at the center of the green innovations are the spirited individuals who are speaking up and building global consciousness. These visionaries are the pillars of sustainable development. In this issue, we share the works of the creative minds that decided to take their love for our planet a step further, producing art from recycled materials or creating a strong statement through their work. I hope that "Artists for a Green Planet" will inspire you to choose an eco-friendly lifestyle with a high degree of ecological integrity. Join us today in our work for an environmentally, economically, and culturally restored planet. The Magazine Created by Artists! A Global Platform For Professional And Emerging Artists Present In 198 Countries With Over 2 Mill Readers! Available in Print and Digital! ArtTour International is an award-winning publication dedicated to exposing visual and performing artists to the eyes of art lovers worldwide in a very interactive multi-media format. With over 2 Million readers in 198 countries, ArtTour International is the fastest growing art magazine in the international market. Available in print, digital, and its renown Web T.V. channel ATIM.TV. It is the go-to international platform for today's professional and emerging artists. A r tTo u r I n t e r n a t i o n a l M a g a z i n e showcases articles of outstanding interest on personalities, trends, and events shaping the art world. Published and Distributed by ArtTour International Publications, Inc. For more information email: info@arttourinternational.com or call 1 800 807-1167 ÂŠ Copyright 2016. ArtTour International Publications Inc. All rights reserved. Reproduction of any published material without written permission of the magazine's publisher is a prohibited by law. A BRIDGE BETWEEN CONTINENTS At the core of ArtTour International is the ability and the promise to inspire our global audience to interact with the wonderful world of art. Our mission is to connect artists with art lovers, collectors, and galleries worldwide, promoting the arts as a vehicle to inspire a renewed collective consciousness. 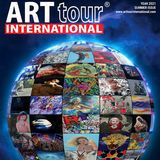 For information contact your sales representative or email: info@arttourinternational.com - Phone 1 (800) 807-1167 Published and Distributed by ArtTour International Publications, Inc. For more information email: info@arttourinternational.com or call 1 800 807-1167 © Copyright 2016. ArtTour International Publications Inc. All rights reserved. Reproduction of any published material without written permission of the magazine's publisher is a prohibited by law. Your window to the world of art! Are you an artist interested in participating in an "Art 2 Heart" interview? Feel free to contact Art 2 Heart at info@arttourinternational.com and share your story of inspiration. A production of ATIM.TV © ArtTour International Publications Inc. All rights reserved. This written gift, tells the success story of artist, writer, journalist and activist, Viviana Puello, Editor-in-Chief and founder of ArtTour International Magazine, one of the most inﬂuential art magazines in the international market in present times. In these pages, Puello recounts her personal experiences, revealing secrets from her journey; sacred moments of pain, failure and the wisdom gained; lessons learned and the self-awareness that has welcomed her to shift life’s obstacles dramatically into life-changing success. www.arttourinternational.com/inspiration Published by ArtTour International, Inc. 45 Rockefeller Plaza Suite 2000, New York, NY 10111 © Copyright 2015 ArtTour International Magazine.All copyrights are reserved by the author. Reproduction of any published material without the written permission of the magazine’s publisher is prohibited by law. ALSO AVAILABLE ON DIGITAL FOR DOWNLOAD! DISTRIBUTED WORLDWIDE! You can ﬁnd ArtTour International Magazine in all Barnes & Noble Stores in USA, McNally Robinson Booksellers in Canada and over 1200 Independent Bookstores and Newsstands Worldwide! PHOTOGRAPHY: Alan Grimandi, Brittany Harrison CUSTOMER SUPPORT: Shipping & Orders: info@arttourinternational.com or call USA: 800 807–1167 iTunes, Kindle, Newsstand Applications: Contact customer service: Call USA: 310 359 8709 UK: 208 196 9503. Ofﬁce hours are 5:00am – 5:00pm PST Monday – Friday. "You can make a di erence, let's paint the world with Recycled Paint, help support the artists behind our social environmental art movement!" - L J Levasseur. I am moved by the actions, history and events that shape mankind, by nature or anything that touches the human spirit. It translates into all this energy, which I can express in a positive way through artwork; I only hope it inspires the same passion, love and hope in others. You can make a difference, let's paint the world with Recycled Paint ! Dress designed and created by Lisa Levasseur with her “Palette Art™” technique using re-fashioned second hand clothing and recycled paint. and “Take Another Piece” among others. When working with acrylics she can achieve a distinct contrast within dark, transparent washes through her ingenious use of the media. This award-winning artist doesn't fall short as a businesswoman, having followed her father's wise path. She runs Terracana Ranch Resort in the heart of the Rocky Mountains near Jasper National Park where she also expresses her creativity as the interior designer. Her art studio is set up as a retreat center Terracana, a dream haven for artists and painters due to the scenery, climate, peace, and tranquility that surrounds the area. There, the artist oﬀers insightful lessons on creating art through recycled paint and also shares her passion and love for nature with motivated and passionate artists who are interested and willing to learn Palette Art™. Human behavior, global history, events, and nature all have a signiﬁcant impact on her work. Her inspiration is driven by all the forces ﬂowing on the same parallel frequencies. Lisa Levasseur believes that all human beings are interconnected, and she uses her art to express her thoughts on life, environment, and social conditions. She intends to help people understand what they may be overlooking, ignoring, or sacriﬁcing in life. Her positive message conveys itself in all of her work. www.topcontemporaryartist.com Dress designed and created by Lisa Levasseur with her “Palette Art™” technique using re-fashioned second hand clothing and recycled paint. This highly anticipated annual awards ceremony is the ﬂagship event of ArtTour International Magazine and draws artists and art aﬁcionados from all around the world. “Aquinnah" Oil On Linen, 48"x48"
merican artist Anne D. Grandin has developed a rich essence in her work revolving around the depiction of nature and its beauty, a concept which lies behind her tireless artistic creation. Her work has been inﬂuenced by her in-depth research around the roots of Native American culture. Nature is at the heart of Grandin's inspiration, becoming highly didactic for the public and helps the viewer appreciate many aspects of life easily overseen. Thus, it is a body of work which demands careful examination to convey the full spectrum of notions and concepts hidden behind it, initiating a fruitful discussion with the viewer concerning our place in the world. “In Memory Of Big Bird" Acrylic, 36"x24"
“World Peace" Oil On Canvas, 18"x24"
is vital for the ﬁnal artwork. Chromatic patterns are elegantly coexisting with the more traditional approach of her subject, with a bold color palette. All these elements create a result which is treading both on tradition and modernity, retaining the vital characteristics of both paths and combining them to create the desired style of painting. All these elements of the works of Grandin characterize her as a painter with a rich artistic expression which earns the recognition of the contemporary art community and thrives in its genre of painting and promoting the beauty of nature. As an artist, she evolves and invites her viewers to a beautiful artistic journey which is vital in our contemporary society. “Human And Nature” Mixed Media, 24"x36"
lexander Makarenko is a Ukrainian graphic designer and artist who has lived and worked since the 90s' in Atlanta, Georgia. His career started in the 1980s in his home country after he graduated from the School of Art of the Ukrainian State University and continued after he settled in the United States. These experiences of long traveling profoundly inﬂuenced his artistic production, becoming the fuel behind his creation. “Birds Are My Friends” Mixed Media, 24"x36"
Should the viewer explore the work of Makarenko in depth then another fundamental theme arises, the appreciation of the natural environment and its beauty. It is a recurring topic throughout his work which frequently depicts ﬂowers, plants, ponds, and animals, showcasing his interest towards the preservation of our fragile ecosystem. The artist aims to raise awareness by promoting sheer beauty to the public, a way in which is immediate and eﬃcient to achieve the ultimate goal of social awareness. The public is left with the ﬁnal opinion when confronting the work of Makarenko, a work which presents the reality of the artist and demands from the viewer a very personal interpretation. “Nature Is My Donor” Mixed Media, 24"x36"
anjerd Lekkong creates beautiful, wrought, steel sculptures of intrinsic details that depict characters of Buddhism both as single ﬁgures and full action scenes. With ﬁgures of that stand up, well poised, full of grace and serenity or dancing and ﬂying the artist proposes an unseen, contemporary view of his subject. Upon closer observation, the viewer will discover that each one of Banjerd's works has been created by smaller ﬁgures that interconnect to form one single body. This fascinating technique intrigues the audience and invites to a close examination of all the elements of the composition. Lekkong’s bold, dynamic, carefully orchestrated multi-layer sculptures explore concepts of unity and interconnectivity opening new, unexpected perspectives to the viewer. A unique concept that draws his audience in for the observation of the smaller sculpted bodies entwined with one another that narrate a diﬀerent story from that one of the central image. Through the masterful use of form and a brilliant creativity, Lekkong speaks a new language to the world of art and succeeds in making unfamiliar what is usually familiar. An accomplished architect and interior designer, Banjerd Lekkong is an artist who reconstructs the perception of his viewers. Original from Thailand he lives and works in Bangkok. A l i s o n B a r rows h a s p ave d t h e way fo r h e r contemporaries to take up ecosystem preservation issues in their stride. Through her art, she hopes to encourage others to stand for the cause of a green planet and the appreciation of the Earth as a fertile, nurturing and loving mother to all her children. “My artistic vision speaks to an acute awareness of the eﬀect of emotional context upon perceived reality. Painting is a daily process of embracing my inner subjectivity with that which is outwardly apparent. I prefer to use an expressionist approach as I ﬁnd it relays my feelings and musings most clearly to myself and others. My subject matter is primarily nature as I ﬁnd within it an immediate fascination and awe. Over the last few years and especially since we have a political administration that wishes to undo the advances we have made on global warming my landscapes have begun to represent a disquieting element, focusing on the dramatic weather conditions at play with the environment. My medium of choice is oils on canvas, and yet at times I feel compelled to add secondary media to a particular work or take on an entirely diﬀerent medium to adequately express what I ﬁnd compelling in my chosen subject. In all of my work, I ﬁnd the use of light to be a central concern to animate and bring the dynamic qualities I am looking for within what I perceive as time frames. I wish to connect the viewer with an immediate, sensual lure, to absorb them into a visual conversation about our environmental concerns." “Protect Our Green" Oil, 40"x60"
“Waiting For You" Oil, 36"x60"
artist paints his own life story and that titles are messages. At present, she lives in the greater Toronto area in Canada and is an avid supporter of several charities and foundations. She has planted over a hundred trees to be there for the next generation. urga Garcia is a leading personality in the sphere of ﬁne art photography and an award-winning ﬁne art photographer recognized for her unique storytelling and surrealist images. Well versed in headshots, animal portraits, and conceptual photography, Garcia has an unrestrained connection with the symbol of femininity, describing the female form as a reminiscent of care, nurture, empathy, sensitivity, and kindness. Using tints of monochrome and earthy colors to relate to the idea of the environment, applying desaturated tones in all her images. The human ﬁgure is a fundamental element in Garcia’s works, dramatically captured against theatrical backgrounds suggesting mysterious imaginary places. With particular attention to color, texture, and light, her compositions lead the eye through a narrative imbued with curiosity and fascination. Garcia takes the viewer to exciting discoveries, using nature, fashion, and theatrics to embody her vision. Playing with light, she takes a highly imaginative approach to photography capturing movements and strong gestures which ﬂow freely through her lens. The internationally acclaimed artist expanded her horizon and turned author with the book, "Your First Photography Book" intended for children. She conducts collective and solo exhibitions for her works in Palm Beach, New York, and other international venues. anadian artist Bruce Allardyce trys to portray wilderness. Often, his art depicts what he believes should be the human role in this wilderness, as observer, protector, custodian. As a member of the species Homo sapiens, clearly the planet's most voracious predator, Allardyce wants us to learn to live with the earth's other great predators. “4 Mixed Color/Yellow" Mixed Media On Canvas, 23"x23"
“4 Mixed Color/Blue" Mixed Media On Canvas, 23"x23"
“4 Mixed Color/Green" Mixed Media On Canvas, 23"x23"
ornelia Steckhan is a German artist who resides in Munich Germany and Imperial Beach California. She is given credit for popularizing Corky Art among her contemporaries, her inclination towards the themes of the universe can be seen in her abstract paintings where she showcases the galaxies and cosmos. Steckhan infuses life into extraterrestrials through her works. Steckhan invests her time profoundly in traveling the nook and corner of the world. She explores less traversed paths to enliven the exotic experience of the locales. Cornelia Steckhan devotes herself in observing the humble nature around her; her paintings send a strong message to preserve the environment. It garners immense attention to sensitive global issues invoking emotion through her steady brush strokes. Her realistic artistry strives towards making our planet more habitable. She captures the audience imagination by her powerful stroke play. “Under The Bridge To Shangri-La China" Acrylic, 90"x47"
Cornelia Steckhan makes a heavy impact through her art to voice her concern over the destruction of natural resources and the ever depleting ozone layer which is the leading cause of global warming. Slingenberg drew instinctively since a young age and later won awards in school competitions with her natural talent. All this made an indelible impression upon her mind, thus shaping the future artist. Trained initially as a Goldsmith, she graduated as a Designer Craftsman in the UK and then moved on to work as a photography stylist. Native American culture and art captivated her to the extent that it became a serious interest and subject of study. Silk being her favorite fabric, she started researching ways to paint on it and soon developed her formula, medium and technique to suit that particular textile. From there on, she began experimenting with painting on leather. “Golden River" Acrylic On Canvas, 30"x40"
“Aquatic World" Mixed Media, 30"x40"
Art is DeSerres' Oxygen Describing art as her "oxygen," DeSerres cares deeply about the environment and protecting animals. Natural landscapes, majestic creatures, and bold pigments are prominent features of her work. Aquatic environments and plants are other natural mainstays of DeSerres' works. Most often, these are illustrated in an impressionistic s t y l e . I n h e r a b s t ra c t s e r i e s , DeSerres takes a storytelling approach with each stroke using i n t r i c a te a r t i s t r y - - c a re f u l ly orchestrated compositions of bold colors that come to life with a spontaneous twist, splashing elements that add drama and depth. The result is eye-catching works of simultaneous contrast that invite the viewer to new worlds of imagination. “Planète Lointaine" Acrylic On Canvas, 24"x24"
“Surging Whale” 2015, Acrylic On Canvas, 40"x30" “I am appalled by the fact that whales have been the center of overexploitation by the whaling industry for so long; despite progress made, so much remains to be done to protect them. This sentiment of urgency stays with me always. “I applied lays of acrylic and other medium and suddenly a silhouette emerged, jumping to safety, covered with blood, like a cry in the night. And there she was: a beautiful humpback whale asking to come forward”. “The Eye Of The Storm” Mixed Media, 30"x40"
“Environment, My life, My Heart...” Institute in Mexico, she began to experiment with the lost-wax technique, creating her ﬁrst bronze sculptures. Drawing Attention To The Plight of Animals DeSerres' work has been recognized all over the world through many exhibitions and galleries in countries such as Italy, Spain, France, Canada, Portugal, Mexico, Tunisia and the Czech Republic. The versatile artist has also embarked on a m i s s i o n t h a t w i l l d e l i g h t e v e r y n a t u re conservationist - exhibiting artwork in such a way as to draw attention to the need to preserve and protect nature. Fragile Coral and Vanishing Elephants are just some of the pieces that are part of her "Environment My Life My Heart" collection. DeSerres says that she has always loved animals and sees the need to protect them, and that painting for them has become part of her life. “Green Sea" Acrylic On Canvas, 30"x40"
truth. She can introduce striking disparity to muted backgrounds, each decision skillfully made. She playfully uses realistic images as focal points on abstract back-grounds, welcoming waves of creativity. Using the canvas as a part of a new world she creates, DeSerres allows objects to trickle their way oﬀ the canvas. Making use of every tool in hand, she brings to life timeless pieces, incorporating the laws of art and making some of her own. “I have always nurtured unconditional love towards all living beings. Animals are part of us and we, are part of them. ey play a vital role in our lives, and so does nature. My heart stops each time I witness atrocities done to animals, whether they live close to me or in remote regions of the world like elephants or whales, two great species we should cherish and protect. Painting for them, with them close to my heart has become a life journey for me”. “Vanishing Elephants,” “Surging Whale” and “Fragile Coral” are part of the “Environment My Life My Heart” collection the artist presents as an ode to life in its diversity. “Le Jardin Bleu" Mixed Media, 30"x40"
“Feline Fashion Harem" Oil On Canvas, 60"x48"
â&#x20AC;&#x153;Borzoi Strut" Oil On Canvas, 60"x48"
“Lily Pad" Oil On Canvas, 60"x48"
Ahlﬁeld has dedicated a series exclusively for animals. "Glamour Portraits With Pets" aims at increasing public awareness about protecting the endangered species of wildlife. The contemporary artist's collection includes "Borzoi Strut" where she displays a Russian Wolfhound walking with the tail erect and spread out. The haughty walking style of the breed equaled to the status of the aristocracy. The leashed dog is taken on a stroll by its elegantly dressed owner. "Feline Fashion Harem" is yet another work which has earned critical praise. The lounge-like setting showcases a model named Alexandra laying on a decadent pillowed daybed accompanied by her three pet cats. The artist decks out the female model in a ravishing brown velvet attire. The protagonist is seen lazily reclining; the feline beauties are relaxing on the cushioned bed with plush pillows in the luxuriously self-indulgent painting. Barbara is a proud sponsor and board member for the foundation, Pet Philanthropy Circle. The mission of this non-proﬁt charity vies to improve the quality of life for animals by promoting greater public awareness of their welfare and the causes that protect them. She supports welfare causes by donating her prints, paintings and services as an animal portrait artist to raise funds for deserving animal rescue groups. The most recent work unveiled by the artist is the "Lily Pad." It is an oil portrait painting starring a charismatic blonde woman with a dog seated on the ruﬄed frills of her outﬁt. The lady is dressed up in an elaborate gown with sparkly sequined adornments. The loose, ﬂowy white dress could be compared to a blossoming water lily. The Greenpeace activist aims at conserving the natural ecosystems ﬁlled with ornamental ﬂowers. During her career as a Fashion Illustrator, Barbara Tyler Ahlﬁeld has received several awards which include the NORMA award for lingerie and cosmetic advertising, the Seklemian award for reﬂective color advertising, the Federated Dept. Store advertising award, Lazarus Division for three consecutive years, and she is also a member of the Society of Illustrators. Since her transition to ﬁne art ﬁve years ago, Barbara was named “one of the top 50 international new artists of 2014” by Art Business News magazine. www.barbaratylerahlﬁeld.com “Algonquins Matilda" Oil On Canvas, 36"x36"
iorgi Bliadze was born in Surami, Georgia; he derives his signature name Giga Surameli from his birthplace. During the initial years of his career, soulful music was his muse to paint. He shares that the melodious sounds made him recreate the serenity on canvas. The international artist travels the globe to absorb the atmosphere emotionally. “Heavenly Landscape" Oil On Canvas, 34"x32"
“Cliff & Seagulls" Oil On Canvas, 23"x31"
He has performed many experiments to discover the most eﬃcient painting materials, using enhanced technology to create fresh styles of art. In this due course, Bliadze has mastered the skill of weaving his canvas. Focusing on four characteristic styles of painting. Among them, the one which is closest to his heart is seascape. He employs new techniques to depict the sudden highs and lows of the alluring waves. He personiﬁes a single drop of water as a human being in this sea of humankind. One of the painter's much-acknowledged work is the "Heavenly Landscape," an oil on canvas exhibit using the Avant-Garde style. A vibrant fusion of fortifying colors completes the piece. Through art, he is fuelling the cause for a greener planet. The awe-inspiring "Mountain Scenery" has muﬄed textures to lift up nature to center stage. The focal motive of the artwork is to throw light on the state of conservation for the environment. Ice-capped mountains are melting, lifeline rivers are dying, and lung spaces trees are cut down. Beads also pitch in the direction of preserving nature. It is an unorthodox, radical style of painting using acrylic. A mirror reﬂection of today's society that brings about fresh air in the minds of his viewers. www.artofgiga.com “Giant” Oil On Canvas, 60”x36” “Valley Taba Klde" Oil On Canvas, 19"x27"
“The Light Of The Night" Collograph, 10.6"x10.6"
udrun Alvebro is a visual artist from Sweden who predominantly chooses an abstract form of artistic expression and creates various a r t wo r k s t h a t i m p l e m e n t a multitude of techniques and concepts. Her work is mostly in the realm of painting, but she also has a large body of work dedicated to collograph, a process about printmaking but having some fundamental diﬀerences. Throughout her work, there is an extreme dedication to accomplish an aesthetically pleasing result, while at the same time remaining faithful to the ideas and concepts that are intrinsically tied to abstract art. “Window House" Oil Painting, 31.5"x39"
Alvebro's works cleverly contrived, "Hidden Space" accesses multiple layers of bright colors used subtly. Though the layers are thin, vibrant patterns make it pop out. Bold lines ﬂuid texture indicate the constant movement of all life forms in the environment. Emphasizing on the uniqueness of human existence, "Light Of The Night" matches the clear message, bright hues and solid patterns, a result of her gifted hands is the combination of organic and geometric prints. She navigates her viewers into the rich wildlife by employing earthy crimson and royal blues. Alvebro uses a childlike approach towards portraying harsh realities of humankind. She combines expression with a composition to create a compelling atmosphere for the audience. “Giant” Oil On Canvas, 60”x36” “Hidden Space" Oil Painting, 23.6"x31.4"
aster of art photography is the gifted lensman Eric Wiles. Eric shows extensive expertise in the ﬁelds of Landscape Imaging, Still Life and Fine Art Photography. He admits that being behind the camera allows him to capture the ﬂeeting moments of life. Through his work, Eric takes the viewer into a surreal paradise. He shares images from his adventure in Kauai and California, capturing the audience attention by his knowledgeable visualization of the Garden Isle. His photos exhibit the Kauai forests lined by dense green trees, waterfalls, secret caves and dramatic cliﬀs of California. The photographer captures the breathtaking scenic backdrops with ﬁnesse. Isolated beaches well emote Eric's works of untouched natural beauty. The California coastline is a heavenly spectacle with gentle waves, unmatched vistas, and solitary sandy shores. Wiles shares images to support environmental conservation. Photographs of wildlife in their natural habitat is in the line of the muchneeded protection of endangered animals. His agenda is the protection of long ﬂowing rivers, lake beds, and other dying water bodies. Eric Wiles encourages for replenishing natural resources to its original self. “Enjoying the Moment" Mixed Media On Canvas, 60"x40"
“Conscience" Wood Carved, Cedar Wood, 21"x16" “Protection" Mixed Media On Canvas, 36"x48"
“Turtles Safety Place" Mixed Media On Canvas, 36"x48"
when one strolls in a lush forest. Other prime examples of such thematic concepts are “Protection” and “Conscience,” both of which portray animals, the other vital part of our ecosystem. Spinatelli raises awareness about the eﬀects caused in the lives of these animals, largely by human means and constant exploitation of the ecosystem. Spinatelli voices through her works the stand people can take protecting those we are cohabiting this planet with, becoming the source and inspiration for a global shift of consciousness. “Breathing with Nature" Mixed Media On Canvas, 48"x48"
Elvira Spinatelli's artworks have been exhibited in major galleries, museums and art shows achieving relevant awards. “Hovering To The Sky" Acrylic On Canvas, 23"x31"
“The Island..The Dream" Acrylic On Canvas, 28"x28"
“Light Of Hope" Acrylic On Canvas, 28"x20"
"Volatile Wishes To The Sky" - Acrylic On Canvas, 39"x31,5"
“We as artists can tell the whole world that we are equal and that our language is the brush, our colors, and our mission is to spread peace and love. We need to love one another and live in peace and security. We must teach our children to love everyone and not hate any human being because of the color of their skin, language, religion or nationality. rough my work, I am trying to send the message to the whole world that we Iraqis are peace-loving people and our civilization, which began ﬁve thousand years ago, has a great legacy. It was here that the ﬁrst letters of the alphabet where developed, the wheel was also invented here and we were the ﬁrst to build outstanding gardens and to have the enactment of laws. I am trying through my work to show the world that we are civilized people and we want to convey our love and peace to all the people of the world and for our children to live in peace and safety and wish for a beautiful and happy tomorrow." “Sun And Hurricane" Mixed Media On Canvas, 28"x28"
While in Wemmel, near Brussels, Frengen conceived and developed the fumagine technique, which is best described as the equivalent of painting with a candle. More than just painting with soot, this method gives a distinctive, stylized look to Frans Frengen's paintings and drawings. It gives his primarily black and white compositions a mere appearance, emphasized by the great shading that is created by the fumagine technique. Despite the bold, thick lines, smudgy appearance, and simple nature of Frengen's drawings and paintings, they are still highly detailed and reveal the artist's deep level of skill and technique. In addition to the simple shades of gray smudging created by the fumagine technique, Frengen also adds bold spots of color to the paintings. The primary colors of red, blue, and yellow are often featured in his work. It is clear that this is the work of a talented artist who has spent many years studying technique and artistic styles. Most of his art features people and scenes from everyday life portrayed in a unique way and with a great perspective. Several of Frans Frengen's fumagine paintings stand out from the rest. One, "Hunting a Human Right," features a musket-bearing hunter and his dogs chasing a wild boar. This simple drawing, painted by Frengen with a candle, is not only remarkable because of the striking details and intense expressions on the faces, but because of his choice to use a single spot of red paint as the only color in this mostly monochromatic painting. Another piece to note is "Mirror on Newport," which features two ships in a beautiful harbor. While the artwork is mostly black and white, a few splotches of purple and green acrylic paint are strategically placed in the water. The ships are delineated with high precision, and the small numbers on the bows of the ships add an extra dimension and detail to these works of art. The bright colors of the acrylic paint contrast eﬀectively with the calm and serene waters. Frans Frengen's unique fumagine technique showcases his brilliant yet simple paintings and drawings. It is clear that this Belgian artist has remarkable talent and skill, as well as a clear voice that has something important to say. “Mystic Beach IV" Oil On Canvas, 9"x24"
“Rogue Wave" Oil On Canvas, 36"x36"
“Illumination" Oil On Canvas, 28"x28"
nspired by her love for nature, Canadian artist Rosemarie Armstrong creates work that reﬂects the constant transformation of the natural world. the context of development, man is clashing with the laws of nature.. Rosemarie Armstrong is a Signature Member of Artists for Conservation, the world’s leading artist group supporting the environment, representing 500 of the world’s leading nature/wildlife artists from 27 countries. Armstrong believes that humanity needs to express concern and respect for nature. Her family lives on the land in a heritage Victorian home in Ontario, Canada. eily Perez-Nomm is an Estonian-born artist currently based in Miami who focuses on photography to narrate stories about human experiences and self-transformation. Combining great technical skills and an excellent sense of composition, Perez-Nomm captures beauty in its full splendor and presents to us her collections "Alchemy," "Metamorphosis" and "Trapped," a series of black and white photography complimented with mixed media collages. In her quest to transcend and expand global consciousness, Perez-Nomm uses her works to raise awareness about the hidden treasures of our planet, opening a dialogue with the audience that comes face to face with the wonders of our environment through her photography. It is a muchneeded call for help to a contemporary society which values industry and trade much more than ecological progress. “Bengal's Inner Peace" Acrylic, 30"x40"
“Share The Earth" Acrylic, 24"x30"
“Lungs of the Earth" Acrylic, 24"x30"
“Time for Peace" Acrylic, 36"x36"
â&#x20AC;&#x153;Children of the Earth" Acrylic, 36"x36"
that ﬁguratively shows a family of great chimpanzees huddled together. He advocates that as stakeholders of the environment, animals too should get their worthy share of space, touching on the matter of Illegal encroachments into natural habitats endangering the livelihood of wildlife. "Home," as in the only habitable planet Earth is the latest oﬀering by the talented artist. The envisioned image deciphers the aftermath of permanent damage. The drastic shift in the ecological balance is the reason behind unruly natural disasters aﬀecting the planet. Presenting the massive increase in sea levels that may ﬂood our world. A man who has lived his purpose through a greater vision of a balanced world. my Li is a prominent art curator in the contemporary art scene in China, a country which has d eve l o p e d d u r i n g t h e l a s t 2 -3 decades a thriving community of artists and a buzzing art market. It is a country with many great Art Galleries, Art fairs & organizations, hosting both renowned European and American artists, but also presenting to the world the new generation of Chinese Artists who become increasingly popular. Art curators like Amy Li have contributed vastly to the development as mentioned earlier, as her dedication, vision, and management has resulted in the rapid rise of fame both of her gallery and the artists that she represents. Despite not being an artist herself, she is an important part of the creative artistic process not only preparing the setting and management of exhibitions but also having a direct dialogue with the artist and provide valuable help to overcome any obstacles. Thus, the art curator in the contemporary art world is a silent ally of the artist, a person behind the scene who guarantees the technical quality and the conceptual elegance which in demand in the artistic production by the public and the institutions. The work of an Art curator is not an easy task, and we at ArtTour International Magazine want to show our commitment to supporting curators around the globe who have demonstrated exceptional creativity and prescience in their events. This year Amy Li's contribution to the international art scene is recognized with the "Curator Award For Excel l e n c e ," T h e a w a rd c e l e b r a t e s curatorial excellence. Revealing the role of the Art curator to the public is also crucial, as it enables us to create a more rounded view of how artistic ex p re s s i o n i s a m u l t i - l aye re d , complex progress, instead of simply being the wishes and ideas of a single person. continuous process of reinventing her creativity with each piece. The dynamic artist procures freshly discovered pigments to add a dash of verve to her paintings. ónia Domingues is glass painter and designer of French origin. Born in 1978, she moved with her family to Portugal at a very young age. The multi-talented artist is skilled in various art forms centered on revolutionary change. On her trips to diverse countries, she cultivated an unusually high sensitivity to beauty, as in nature. works. Emphasizing that art is capable of converting silence to sound, stillness to motion and inanimate to living. In her own words, she constructs, creates and paints what she has dreamt before. She aﬃrms that every painting of hers casts itself through her innate vision. In her work "Do You See Our Planet," a a mixed media painting on waterproof MDF with suspended eﬀect, Domingues touches on the elements of ﬂoral, technological and diamond. The pristine beauty throws light on the need to conserve the environment. The green warrior struggles to educate art lovers to imbibe everyday practices that are ecofriendly. She vehemently persuades people to support campaigns targeting the preservation of the planet. Sónia Domingues has participated in both collective and individual 36"x36"She is highly exhibitions in“Ivory" theAcrylic, world. collected in art museums and galleries all across the globe. “One Day our Planet will be so Green that even at night it will bloom with a bioluminescent glow because there will be overabundance on the summit of the mountains, in the desert plain will be planted the Juniper. The king's fruits will grow as in Lebanon, and in cities, people will ﬂourish like the vegetation of the Earth..." Thus, says the Holy Scriptures - Psalm 72:16 / Isaiah 41:19 Mixed Media & Pointillism, Silver Leaf, and Pointillism, Green Translucide and Silver, Gold, Red Gold, Swarovski Elements & Luminescent Micro-points. In Symbol of an ideal life in and of our planet. Inspired by the Biblical Prophecy by Isaiah, the Countries/Continents are presented with an Equitably density of population and with the creation of luminescent micro-points, the Planet Glows in the Dark - by Sonny. “Heaven and Earth” Acrylic On Canvas, 20"x16"
“Magic Canyon II" Acrylic On Canvas, 24"x36"
“Fall II" Acrylic On Canvas, 36"x24"
“Gold Tree" Acrylic On Canvas, 36"x24"
ward-winning artist Shifra Levyathan is a contemporary Israeli photographer whose works focus on scenes that can be witnessed in a city often in public spaces or appearing in a setting which is a reference to modern life. She is comfortable in clicking both the natural landscape and cityscape and utilizes juxtaposition of colors to create a three-dimensional eﬀect. Levyathan takes inspiration from the colors, smells, textures and the energies of her surroundings. The tones and hues found in the desert sand, the diversity of people and their culture, the contrast between modern and antique buildings at the grand metropolis, all become the center of attraction in the images captured by her camera. She mirrors the mood of the city dwellers In her humanitarian series "Ghost Of War," Levyathan depicts victims of war, opening a window to her soul she brings awareness of the pain and tragedy experienced by many in current times. Levyathan lives and works in Ramat Gan, Israel. "When l discovered the digital camera and the software to go with, l became addicted to this medium and its vast possibilities. e photograph is for me like the canvas for a painter: I add or subtract from the photo and create what I see in my mind’s eye. My pictures reﬂect my moods, and life around me, be in private or general. I'm an Urban photographer. I love the city, its people and its Architecture. e high-rise buildings with glass and chrome create beautiful distorted reﬂections. People are intriguing with their colorful personalities and actions. When l stroll in the streets with my camera anywhere in the world, l try to capture moments and episodes that will never come back. Even though it 's hard today to create something e n t i re l y n e w , e v e r y a r t i s t h a s something unique only to him. I hope that my art, or at least my eye, is unique only to myself." â&#x20AC;&#x153;Green Goddess" Artivism Performance In San Francisco For The Legalization Of Medical Cannabis. July 4th 2016 In San Francisco. of their selections in the Year In Photos, 2014. Both Nation of Change and True Activism also selected her artivist performance-protests to raise awareness about the ongoing Palestinian genocide as "Number 3" in their lists entitled, one of the Most CreativelyAmazing Protests Ever! Jil Love's most recent work was on her birthday, March 4th, 2017, in Mexico City where she brought together 43 women to portray the pain and suﬀering of the mothers of the 43 Mexican students who went "missing" September 26, 2014, while commemorating the anniversary of the 1968 Tlatelolco Massacre. Love created a procession around the Historic District using the Mexican folklore legend of the Whipping Women who are looking for their missing children. Her performance got international media coverage, and thousands of people around the world were informed of this tragedy that the Mexican Government is still silent about. “#NOKXL Pipeline" Artivism On Hollywood Blvd May 2015. Photo By Michael Wiznu Wisnieux. Jil Love's Artivism protests have been featured in major Newspapers and Magazines like the Wall Street Journal, Washington Post, Huﬃngton Post, LA Times, Grazia Magazine, Art Tour International, Art Sheep, Le Monde and much more. Jil Love has been recognized by the city of Los Angeles for her eﬀorts and achievements. She has published a large-format book that documents all her Artivism protests to date entitled "We Are The Voices Of The Unheard. “ Available for purchase on Amazon. “Oil Is Death-Water Is Life" Artivism For Standing Rock San Francisco November 2016. Photo By Richard Quinn. â&#x20AC;&#x153;Planet" Ballpoint Pen On Paper, 20"x28"
usanne Hauser is an accomplished Swiss artist whose works explore notions and ideas concerning our world and society, while always experimenting with innovative art forms. The forms and patterns that appear in her works are predominantly biological, while less frequently she has a more architectural approach which serves as a solid foundation for her artworks which exhibit greater expressive freedom. Nature becomes one of the protagonists throughout her art. Shapes, patterns and direct references to animals or plants combine drawing with elements of abstraction, collage, and graphic design. Thus, it is a personal work which values diversity greatly, a feature seen as a hint towards the Utopia and organic diversity of our natural world. â&#x20AC;&#x153;Oceans" Charcoal & Ink On Paper, 39"x28"
“African Wealth And Woes'' Oil On Canvas, 59"x59"
"My art is inﬂuenced by a couple of Chinese masters: Chang Ta Chien and Zao Wou Ki. I am very fascinated by the unexpected e ect and forms created by splashing ink and watercolor. e patterns of colors and the layers of ink I apply to reﬂect the magniﬁcence of nature give me endless inspiration and let me enjoy to describe endless beautiful scenery and fantasy from the mind. “Wave Series #2" Ink And Water, 12"x18"
orn in Beijing, China, Wei Yan's bases his technique on traditional Asian art with the use of rice paper, silk, ink, and brush for his creations. After relocating to Canada, Yan developed a style that mixes his original traditional techniques with modern oil and acrylic painting from the west. Wei Yan's recent series takes inspiration in ocean waves. Deeply aﬀected by the uncivilized sightings, he addressed this collection to nature. Through his customary innovations and individualized alterations, he chose to carry forward his eco-friendly intention. The piece ﬂags a warning signal to awaken the minds of the people. All images of the scene originate from the artist's dream and imagination. They are all symbols of great love. The tide will rise up or down, the loving heart of nature will remain unchanged, because the artist believes there is love in the heart and great beauty in the world.. He is a global advocator of preservation of the existing ﬂora and fauna. “Conﬂict" Ink And Water, 12"x18"
Wei Yan currently resides in Oakville, Ontario he often showcases his work in the US, Canada, France, China and Italy. www.yanwei.ca “Wave Series #1" Ink And Water, 12"x18"
“The Engulfed Gardens" Spray Paint On Canvas, 59"x78"
Detail of “The Engulfed Gardens"
Demonstrating multidimensional pieces of art on canvas alongside wood. In the architectural space, innovating with full installations, substituting the traditional canvas with walls or ﬂoors. Owing to their similar tastes, Karly and Anne V joined hands to work as one; they share common liking towards cosmic events, radical customs, implausible feature ﬁlms and new age art. The artists employ the timeless technique of chassis to confront the fervor of street art. A manifold of volumes achieved by using the Italian drape method. Engulfed gardens is a piece dedicated to the cause of environmental preservation. The work evokes curiosity, popping colors of ﬂowers amidst amassed greenery depicting the authentic beauty of nature. The couple has aesthetically conveyed the message about the muchneeded awareness of a green planet. At the moment, they build modular and polymorphic art forms. These structures respond to sensory units and are related to the pictorial text. They are open to collaborations to instill newness in their existing work. The endowed personalities develop the idea of time to be an elastic thread. They abolish the bridge formed by human evolution and mythologies. - Fabian Perez - October 2017.
delightful children’s picture book with a powerful and positive spiritual message, written and illustrated by Mexican - Italian ar tist AnnaPaola Gorozpe PérezPría. Presented in a bilingual format in English and Spanish, this book promises not only to deliver a profound message but also to instill cultural exchange to children and promote an innovating language learning skills throw art. In this tender story touched with emotions , the writer has created a moving parable for readers of all ages that offers profound and valuable life lessons , teaching the importance of optimism, gratitude, forgiveness love and a serene acceptance of one’s capacity to love. Written and Illustrated by Anna Paola Gorózpe PerezPria. “My work tends to be in two mediums, Acrylic, and Pen and ink. My work uses an abstract form and inspiration from Zentangle using of color. is exploration allows me to create from within and disappear into my work." haron Ross' paintings deal with the spirituality of both the artist and the subject, containing calming and emotive feelings through the atmospheric nature of her subjects. Her works are soothing and provoking depictions of the animal kingdom. In her series, she explores animal symbolism and the inﬂuence of the animal spirit on one's development. For the artist, animal symbolism can be of great help in our quest for self-discovery, and each creature emerges in our consciousness to guide us in our journey. With her work, Ross presents to us a choice of interpretation. For animal lovers, her work is a great proponent of the beauty endowed by nature to these wild beasts; on the other hand, the symbolic meaning of the works gives us a pictorial representation of the courage and strength that these animal spirits come to teach us. www.sharonross.co.uk “Evanescent" Pen and Ink On Paper, 22"x16"
“Tropical Riot" Acrylic On Board, 31"x39"
rgentinian artist Lucy Mattos grew up surrounded by the ﬂowing rivers and robust mountains of her native Argentina. Mattos is a ﬁne arts professor whose works showcase references to her roots with imaging of ﬂora and fauna, drawing parallels to the memories of the natural vegetation in her childhood. From monumental sculptures to artistic jewelry, Mattos’ work plays with shape, reﬂectivity, color, proportion, and ﬂow. With masterful use of materials such as bronze, silver, wood, white metal, acrylics, stone, alabaster, polyester resin, and natural ﬁbers, Mattos creates sculptures of intense contours, ﬂowing lines, and dynamic forms, depicting the human ﬁgure. The sculptor exhibits the feminine ﬁgure by surpassing traditional techniques. She created an illuminating method called polyester intraluz, wherein visually bright light is emitted from the sculpture. “¡Basta! (Enough!)" Bronze With Green Patina Finish, 8"x24"x16"
The root and inspiration of Mattos'creations come from Mother Nature. She utilizes naturally available resources such as stone, marble, resin, and wood. Similarly, in her art installations, she uses lace cloths, leaves, feathers and natural sunlight by shunning plastic. Mattos has a made an eco-friendly choice sustaining renewable energy. In 1994, Mattos began an environmental movement in the city of Buenos Aires. She brought awareness to the increasing environmental pollution caused by humans. In the backdrop of a botanical garden, she shaped mannequins and baby dolls with acrylic balls. Mattos titled her work Celebracion de la Vida, meaning 'celebration of life' in Spanish. Mattos' latest creation “Basta” (Enough) unveiled in the year 2016, is a magnetic bronze installation with a shiny patina green ﬁnish. The fundamental theme of the ﬁgure was of universal oneness and unity. She targeted people from all walks of life, despite their nationality, race, color or religion. become obsolete due to the rapid urbanization of the modern world. Her artworks like “Cascading Falls” underline this conceptual focus, as she creates an image in calm blue and turquoise, emanating a sense of tranquility and movement to the viewer and thus promoting the beauty that can be found all around our world. The work of Susan McCollough is one which includes exquisite environmental sensitiveness, the work of an artist who loves nature and wishes the public to experience an alternative view on this timeless subject of art. Finally, environmental awareness is not promoted by portraying the destruction caused by our technological society, but rather by showcasing the spirituality of nature and the way that people can ﬁnd multiple causes to protect our fragile world. uby Purple is an internationally recognized Australian artist who creates abstract expressionistic paintings of vibrant colors, textures, and movement. Conceptually, her art aims to bring awareness to the preservation of our environment by exploring the elemental and emotional impact to humanity and our natural world. Purple's works are personal pieces inspired by her life experience and transformed to convey her message. She extends her creativity by oﬀering wearable art where she designs bespoke pieces and Vegan-friendly scarves made of fabrics displaying her transposed artworks. She also provides a licensing service allowing designers the use of her artwork images. Founder of Ruby Purple Creations, she is dedicated to providing aspiring artists with a variety of services designed to expand and enhance their ﬁne arts awareness and ability. Services focus on abstract painting and the art-making process as a whole. “Connections 27 (Abstraction Of Connections 19)" Oil, 16"x16"
These works reﬂect Ruby Purple’s progression from the real to her abstraction. She extracts the underlying essence of what is seen and presents her abstract impression. A reveal of Ruby’s conceptual process aiming to bring awareness to the preservation of our environment. “In life no matter what you do, you have to take a leap of faith, as none of us know what life is going to serve us in the next moment. If you learn to swim, ﬂoat, balance and adjust yourself through di cult and good times, only then life will bring you to enjoy.” - Hema Thakur she often includes decorative motifs that are repeated to form beautiful visual patterns. In a similar way, the ﬁgures that appear in her artworks follow a path that avoids a direct, detailed portrayal and rather aims to a more emotional depiction. In essence, it is the choice that renders the value of the artwork more holistic, as it has a wider symbolism and focuses on the entirety of human existence. Hema Thakur 's works evoke the notion that nothing is dead until people forget it and that we could always ﬁnd inﬂuences in the past that relate to our present and future. All these qualities, both technical and thematic, can be seen throughout her imagery evident in her artworks "Peace Of Mind," and “Sailing In Love”. Both of them have the common element of placing a stylized female ﬁgure in a vibrant, colorful environment using water as an essential part of the c o m p o s i t i o n , s o m e t h i n g t h a t h a s p rofo u n d conceptual implications. It is a direct reference to the tranquility, ﬂuidity, and spiritualism that has been traditionally connected with water throughout the ages, creating not only a visual background to her ﬁgures but a thematic one as well. Thakur has eﬀectively oﬀered her audience a walk through past, present, and future all in the whisk of her brush. “Perù, Amazonia - Alba Sul Rio Madre De Dios" Photography - Copyright © Aldo Basili, Turin. All rights reserved. “Perù, Amazonia - Pescatori Sul Rio Madre De Dios" Photography - Copyright © Aldo Basili, Turin. All rights reserved. “Perù, Amazonia - Bambina" Photography - Copyright © Aldo Basili, Turin. All rights reserved. “Perù, Amazonia - Famiglia Del Rio Madre De Dios" Photography - Copyright © Aldo Basili, Turin. All rights reserved. “Perù, Amazonia - Lago Sandova" Photography - Copyright © Aldo Basili, Turin. All rights reserved. “Perù, Amazonia - Piroga Sul Lago Sandoval" Photography - Copyright © Aldo Basili, Turin. All rights reserved. “Perù, Amazonia - Traghetti Per Il Brasile" Photography - Copyright © Aldo Basili, Turin. All rights reserved. “Perù, Amazonia - Villaggio Sul Lago Sandoval" Photography - Copyright © Aldo Basili, Turin. All rights reserved. “Perù, Amazonia - Funghi Nella Jungla" Photography - Copyright © Aldo Basili, Turin. All rights reserved. “Perù, Amazonia - Jungla" Photography - Copyright © Aldo Basili, Turin. All rights reserved. “Perù, Amazonia - Radici Volanti" Photography - Copyright © Aldo Basili, Turin. All rights reserved. Basili transforms photography into a comment on the ﬂuidity of time and society, which leaves nothing untouched and has an eﬀect that when unearthed becomes evident and crucial. In essence, his artistic expertise is something recognized by his long presence in the community of contemporary art; he proves to be an individual that constantly wants to explore new ways of artistic expression showing that there can always be new forms and techniques that transcend any boundaries and any borders. “Perù, Amazonia - Scimietta Nella Jungla" Photography - Copyright © Aldo Basili, Turin. All rights reserved. "Perù, Amazonia - Il mercato di Puerto Maldonado" Photography - Copyright © Aldo Basili, Turin. All rights reserved. “Till Death Do Us Part 2015" Oil On Canvas, 32"x24"
People came to him from all over. They came because their hearts and minds were weighed down by thoughts and feelings, because they felt crushed by worry, anguish and helplessness. Some only looked once into his eyes and could return to their reality glowing with a sense of relief. Others needed much longer to heal, seeking the intimacy of the wild bird again and again. But all who came were healed by the power he radiated. Suddenly everything changed. The eyes of the wondrous bird misted over, his look turned inward, and his plumage became ﬂaccid and dull. People from all over kept coming, but now to watch in sadness as he grew ever weaker and ever smaller. Bewildered and helpless, their desperation deepened. “Lost" Oil On Canvas 26"x30"
“The Power Of Thought'' Oil On canvas + Object, 41''x49''x4'’ Featured on the back cover of the ATIM Summer issuem this masterpiece by award-winning artist Katrin Alvarez was also published in the interior pages of the ATIM Top 60 Masters 2017, our annual publication that compiles sixty of the most recognized master artists in the international art scene. ArtTour International was proud to present the award “Premio Alla Carriera" to master artist Katrin Alvarez, in recognition for a very successful career, and for her dedication and excellence in the arts. Only one “Premio Alla Carriera" is presented each year, and we are honored to recognize this great artist of our times. The people came and sat down around him in row upon row, stretching to the horizon. They surrounded the enfeebled bird with all their love and strength. And lo and behold – one day he opened his eyes, stretched upward, tentatively spread his wings, and thankfully heard within himself the powerful sound of life returning. The cheering rolled toward him like a gigantic wave. As it wrapped around him, his plumage ﬂushed brightly in the colors of the rainbow. He was again ready to give hope. “Dummer Zufall (Stupid Accident) 2013" Oil On Canvas Plus Object, 17"x21"
ﬀering a grounding experience into a series that honors all aspects of the feminine, Elizabeth Brownrigg gives her audience a grand scope into her works. Using clay as her principal tool of expression, this simple, yet rich material becomes the basis for her series focused mainly on ﬁgurative elements that become the central theme of her body of work. Facial characteristics and the female form are the typical protagonists of her works, taking often distorted poses that propose an emotional complexity of the depicted ﬁgure and thus create an intricate dialogue between the artwork and the viewer. She uses nature as an active force in her pieces, inviting the idea of unity between the human ﬂesh and that of mother nature. There are often ﬂoral patterns that coexist and combine with her characters, creating a dream-like result which is based both on the richly decorated Baroque-inﬂuenced sculptures, as well as to the more surrealist elements that have such subconscious images which evoke the dreams and the imagination of the creator. Her work is a fusion between the ageless tradition and her creative imagination, an artistic body of work that oﬀers many unique vantage points which illuminate pottery and sculpture freshly and unexpectedly. It is work with elegant simplicity, but not without the depth of study and deliberate creation, a combination which creates the unique personal touch of Elizabeth Brownrigg. Brownrigg has another absorbing body of work, one which is more closely related to traditional pottery as she consistently creates decorated vases, plates, and other objects by utilizing her knowledge of sculpture as well as her personal artistic touch. What diﬀerentiates them from most ceramic/clay objects is that she has a unique approach towards every one of her creations, having diﬀerent coloring, textures and a plethora of patterns implemented as well as a vivid imagination regarding the actual shape of the object. Thus the public experience a new view on the approach of pottery, something which is always refreshing to see on such an ancient tradition of our collective cultural history. “Embracing The Goddess” Mixed Media, 36"x32"
www.isisrising.net “Stepping Into The New Millennium” Charcoal, 36"x32"
“Duality And Pleasure (Dualità e Piacere)” Oil On Canvas, 31,5"x47,2"
“Le Petite Charlotte (La Piccola Charlotte)” Oil On Canvas, 23,6"x35,4"